When firing up an NES game in the modern day, no less a silly spin-off sports title from the era, a certain mindset is required. If you're intolerant of sticky animation, that flickering effect that NES games have when there's too much on screen and wonky frame performance, there are plenty of games that are immediate turn-offs. 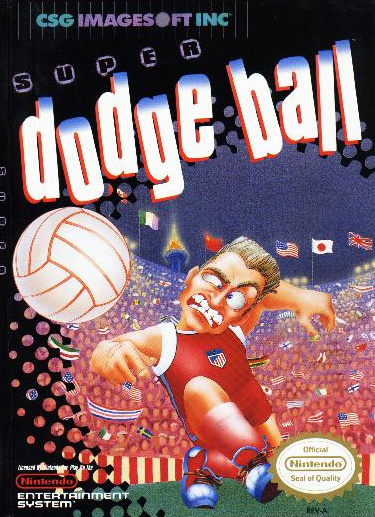 Super Dodge Ball suffers from all of these problems, but it's also ridiculous, funny and oddly compulsive. That irreverence works nicely considering the subject matter. While Dodge Ball can be treated as a serious business if you so wish, there's little doubt that — like many sports and games, in fairness — it's rather silly. You run around throwing a ball at members of the other team, either catching or dodging when it's hurled in your direction. 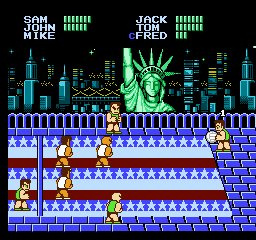 It's a playground game that's inspired wacky Hollywood comedy movies, and in this case was clearly a source of amusement for the team responsible for spinning off the world and characters of River City Ransom. It takes violent, caricatured characters and has them battle it out in a simple and rather juvenile sport. In effect it's comedy gold in 8-bit form. Even accounting for the limitations of the NES hardware, the level of expression is impressive and likely to prompt a laugh. The first time you realise that a double tap on the D-Pad allows you to sprint and execute power shots, this goes from a ho-hum "is this really a thing?" experience to so much more. In no time you're throwing wacky curveballs and multiple variations besides, sometimes as running throws or — by pressing A and B together — while leaping in the air. It's ridiculous fantasy, and oddly exciting when in a tight match. The main single player World Mode, which can be cleared in well under an hour, sets you on the task of defeating teams from around the globe on impressive courts conveniently right in front of notable landmarks, in some cases. You have three players on court as well as another three standing on the edge around the outside in the opposition's half. 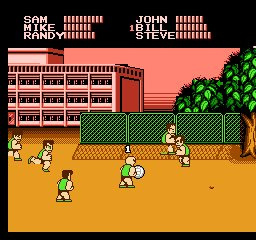 Unlike the rules of real Dodge Ball this is more like a brawl, in that every member of the outfield team has a health bar. You'll need to hit each opponent multiple times before they're out for the count, and the first to wipe out all three players on the other side wins. Some power shots are harder to pull off when your player is low on energy; a humorous touch is how characters become dazed and take time to recover from knockdowns as they're weakened, with a funny animation as standard. As you battle through the rounds the focus is on figuring out which shots — jumping or running — your players specialise in and trying to use power throws to send the opposition literally flying backwards off court. At its best it's not just fun but almost intense, as you try to get the timing right of your sprints and throws while catching or ducking attacks that come back your way. The only frustration is when the opposition team is down to a single player and starts throwing long passes to the outlying players in your half — they simply toss the ball around between themselves while you wait for them to attack, sucking momentum out of the match. It's a tactic open to you as well, naturally, even if it's not in the spirit of ludicrous over-the-top Dodge Ball. On the whole this World Mode is undeniably quirky and fun, while different settings and opponents have neat variations in surfaces — running on ice is tricky, who knew? — and power moves, giving you the task of avoiding ever more deadly attacks. With three difficulty settings, too, there's scope for a good couple of hours of fun. Versus Play is exactly as it sounds, a local multiplayer option and ideal for some laughs with a like-minded friend. Perhaps the most ridiculous and pleasant surprise, however, is Bean Ball. Playable in single or two player, this puts a gaggle of characters in one open area with just one ball; it's a free-for-all with no rules. It can certainly raise a laugh when a mini-horde of characters all sprint across the arena after the ball — juvenile, silly and wonderful. Like a number of titles of its era, however, it's not without problems. The replayability and mileage you get is entirely dependent on whether the premise and gameplay manages to charm you, as the content outlined above is rather limited in breadth. There are the technical issues, too, including the aforementioned flickering and a chugging framerate that improves when a couple of players are knocked out of matches. It's not all negative on a technical level, however, as the visuals have some nicely designed sprite-work, while the music and sound effects capture the NES age rather well. Super Dodge Ball is a silly, slightly crazy game that isn't exactly bursting with content. It's relatively shallow, too, though does add zest and humour to the most simple of concepts, all with a healthy serving of charm. It's likely to be divisive in that if the humour doesn't tickle you it delivers a solid if unspectacular NES experience; if it does manage to make you laugh and capture your attention, however, it's an odd retro treat worthy of consideration. I can't believe I actually wanted this game as a kid. Super Spike V'Ball is where it is at. I have so much nostalgia for this game. I didn't own it as a kid, but rented it often. It will be cool to play it on the gamepad screen. I hope it comes to the US Wii U eshop soon. I love Super Dodge Ball. Great review BTW Thomas! I appreciate that you were honest about the flaws, and could still recommend it as a fun game. Overwhelmingly positive review, ends in a 6 / 10. Oh man this is one of my favorite sports games!!! So much fun! I fully agree with this review. After trying it out at a friend's house, I was disappointed how "awesome" it turned out to be. 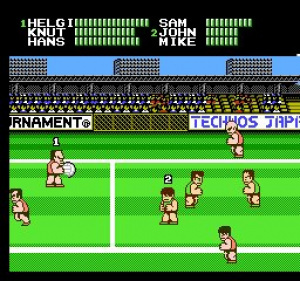 I'd take Mario Sports Mix's Dodge Ball over this anyday. One thing I will give Super Dodge Ball credit for is health gauges for each player, as well as the music for the last team you have to face in the single player mode. 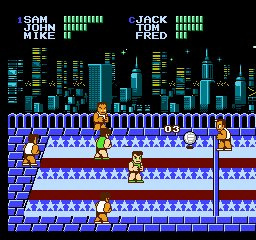 One of my favorite NES sports games. It's funny how this game and River City Ransom got VC releases but Nintendo World Cup never has. Still though the amount of Kunio games we have compared to Japan is a joke. @Ryno super spike v ball is amazing, but pure fun I pick super dodge ball! Downloaded this on Wii years ago. Fun game, I give an 8 out 10. My little brother and I played this game for so very many hours as kids. Many fist fights were caused by this game. I need to see it come to WiiU. I played this in the arcade first. This version is pretty good, but the PC Engine game (Japan Wii Shop, natch), addresses the technical issues and offers a lot more challenge. @OptometristLime I don't think you read the whole thing properly. Are you reviewing super dodge ball advance next? Oh I quite enjoyed the review portion, my comment wasn't meant to undermine your reviewing style. Final scores are too arbitrary though and invite comparison with other, dissimilar games. The Super Dodge Ball: Advance game was pretty darn cool, beating elite teams and unlocking their players, or choosing an underrated squad for their unique throws. Sounds like I would get some mileage from the NES version as well. I loved this game as a kid and would spend hours playing it at my cousins house. By the same token I played Super Mario Bros, Off Road Racing, The Legend of Zelda, The Jackal, Rescue Rangers, and Ducktales all bring back great memories. 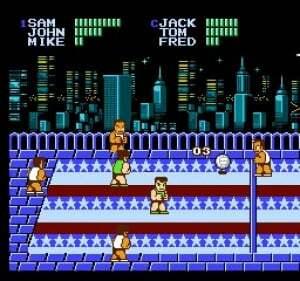 One of my all time favorite NES games. Get 2 people with good skill at this game and you will really have some exciting matches. There is far more strategy burried In this game than the review lets on. Oh look guys, another Nintendolife writer who probably didn't grow up with a NES so thinks all the great games are mediocre. Nothing to see here. The only time I've ever seen a NES game get a good score here is when it's Mario or Zelda. Pretty sad. Super Dodgeball Advance was so good. This doesn't look bad either.